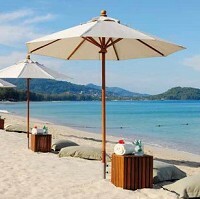 Sand at one of the most special beaches in Phuket is renowned for its healing properties, believed to cure muscle ache, joint pains and other ailments. Local people claim that the special mix of minerals in the beautiful Mai Khao beach has even cured people who are paralysed or cannot walk. As a lot of people from around Phuket and other provinces such as Nakorn Sri Thammarat, Trang and Krabi come to the area for sand treatment, the area has come to be known as a "model village" that promotes health. "The Public Health Office members also train people here to prevent health problems like diabetes," told village leader Manote Saithong to The Phuket News. People suffering from back, leg, muscle and joint pain, bury themselves under the beach's hot sand for several hours to get relief from their ailments. Travellers keen to try the sand therapy may want to take an appropriate medical travel insurance before going to the beach in Thailand. Jamroen Kaewsarn, a 72-year-old local resident, who spends one or two hours every afternoon buried under the sand at Mai Khao beach for the treatment of his back and leg pain, said his health has improved a lot. He added: "It's like you are getting massaged. I can feel the weight of the sand pressing on my body. Afterwards I feel relaxed."